Table features folding offset legs for extra leg room. It has a mocha granite(brown) top with black frame. The locking mechanism is attached to the back leg only for a little extra leg room. 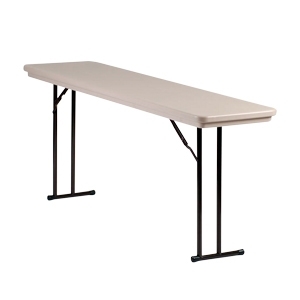 The table is lightweight and easy to breakdown and setup. Resistant to stains, and water. Lightweight-Only 34 lbs overall table weight. This table normally ships within 3-5 days.